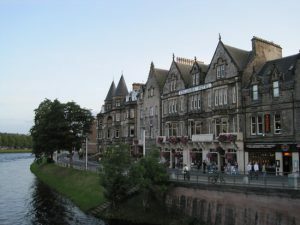 While not the most popular tourist destination in Scotland, Inverness is still an integral part of Scotland’s tourist trail providing a necessary stopover point for people touring the country. The town is situated at the point where the Caledonian Canal links the infamous Loch Ness with the North Sea. Its close proximity to Loch Ness makes it an ideal place for those looking to explore the myth of the legendary Loch Ness monster said to reside in the depths of the massive lake. Despite being a small city, Inverness is well equipped for tourists and offers plenty of attractions to keep visitors happy before they head off to their next Scottish destination. Cultural interests are easily found at art galleries and theaters around the city, the latter often presenting traditional Scottish performances of either a musical or visual nature. Galleries available include the Castle Gallery on Castle Street, the Riverside Gallery on Bank Street and the Art.tm gallery located on the banks of the River Ness. Inverness is a typical Scottish city which has retained the influences of its Celtic past. Visitors looking to experience a little Celtic culture can take a trip to the Spectrum Centre Theatre, where traditional Highland ‘ceilidh’ is regularly performed, complete with Scottish dancing and bagpipes. Alternatively, purchase a piece of tradition for yourself at the Hector Russell’s Scottish Kiltmaker Visitors’ Centre, where kilts and a variety of tartan products are available for sale. No holiday to Inverness is complete without an excursion to Loch Ness. The area is a popular tourist attraction, and sees visitors in their droves arrive throughout the year in the hope of doing a little monster-spotting. Visitor centers that provide more information about the legend are located at Drumnadrochit. If ‘Nessie’ isn’t your thing, then satisfy yourself with exploring Inverness’ surrounding countryside, which provides fresh air, stunning views and many a photo opportunity.